Well, a one shot Land Tax, sort of. It let's you get plains, which means any multiland that is also a plains is also fair game. The only really complaint I have with this card is that its not an instant, which would make it a top level card for me. Even so, as a sorcery, its worth playing in limited and casual, and even some constructed decks that need mana consistency, but should be played more as a mid-game than early game card. Give it a try. Let's see here...Land Tax was a great card. And we all know that Tithe was pretty good. So we can assume that Gift of Estates is good as well. Getting to search up three lands when you are behind is great. It can give you extra cards to discard. It provides mana for spells. It can load you hand of for a larger Empyrial Armor. I can see several uses for this card. And for just two mana it is a steal. I'm a bit stuck on what to think of Gift of the Estates. It has a good land-searching ability, but I'm not sure it is good enough. 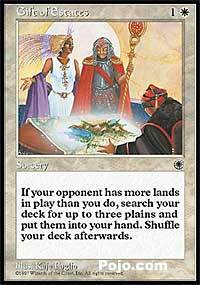 When I think of cards that search for lands, I see that a majority of the them that see play either grant their ability on multiple turns, like Land Tax, or come attached to a body, such as Sakura-Tribe Elder. I won't rate Gift of the Estates too high, but I won't quite say that it isn't worth consideration. In limited, Gift of the Estates shows a bit more promise, as getting land-screwed is a decent possibility. It also can't hurt to thin your deck out in an effort to help find your business cards. A really nice card...thins your deck and assures that you'll have the Plains you need. Another card that is seeing high traffic since the Portal inclusion announcement. In casual, absolutely awesome, and in limited, a MUST play.